Our project bags are designed with care for the modern knitter or crocheter. We believe in well-designed, functional knitting or crochet project bags that are simple and easy to take with you on the go, in gorgeous modern fabrics that suit your aesthetic tastes. 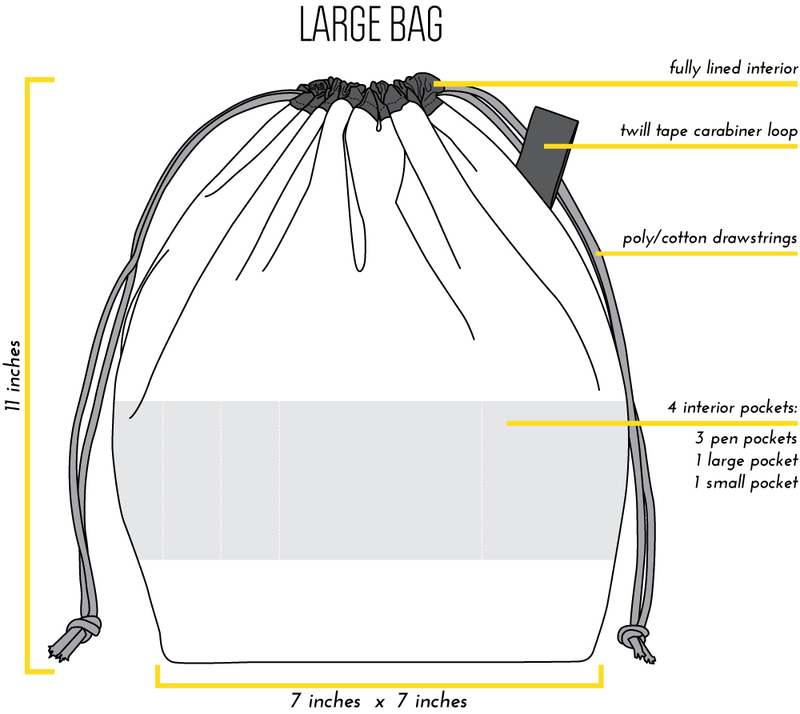 We offer a range of bag sizes to meet the needs of any possible knitting or crochet project. All our bags are made with high-quality, beautiful modern fabric, are fully lined, washable, and have thoughtful details like cotton rope drawstrings that stay open or closed when you need them to, carabiner loops for crafting on-the-go, and many pockets for notions! Large Bags are our favorite size, they're perfect for larger projects like sweaters, colorwork, and shawls that require multiple skeins of yarn. You can really fit a lot in these bags—folks have been known to turn these bags into not only their project bag, but also their purse! Washable—spot cleaning is best but is machine washable on delicate cycle in cold water. Air dry or low heat in the dryer. Iron as needed. Our Small Bags are perfect for socks, shawls, cowls, and other small one or two skein projects. We also love them for when you don't want to carry around a large bag for those on-the-go projects, but still need some space! 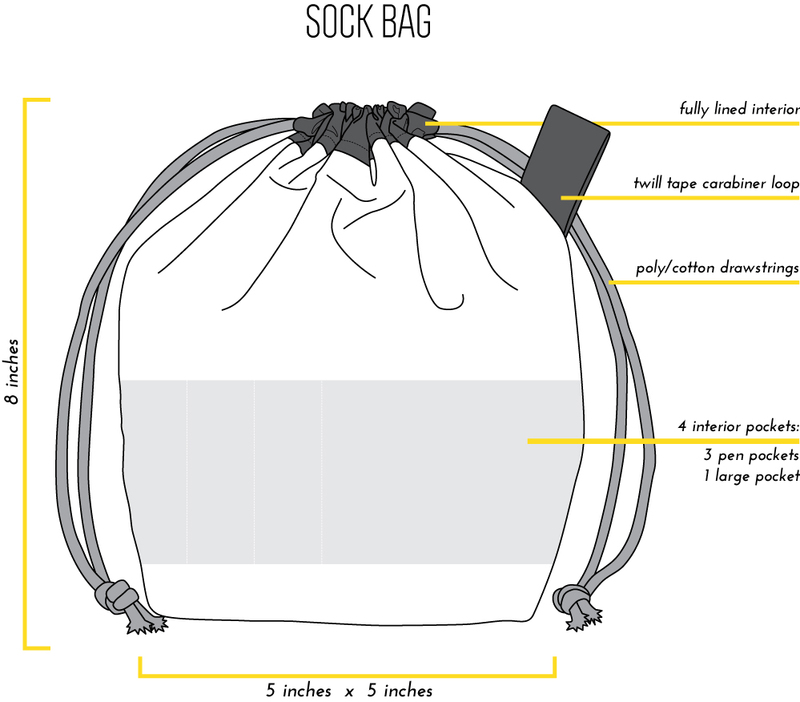 As the name implies, Sock Bags are perfect for sock projects on the go! These little, but mighty bags hold one skein of sock yarn, plus any additional notions. We love them for knitting on the bus, train, or subway! 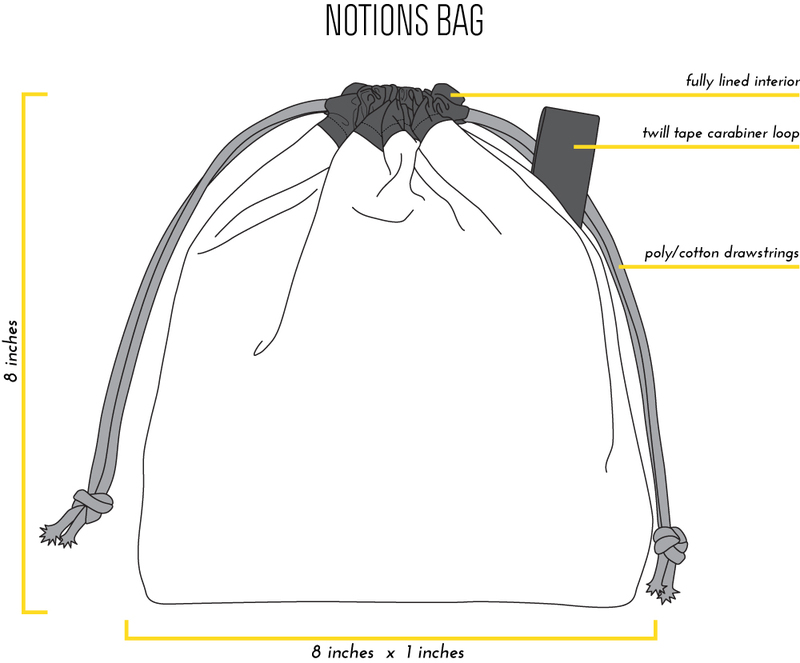 Notion Bags are great for notions, they are small but will hold just about anything you might need while out and about, from stitch markers and small scissors, to needle gauges and tapestry needles, etc. We also use some of ours to hold our thread trap jars, scissors, and embroidery floss while working on cross stitch or embroidery on the go! Another great use is to hold Schacht's Zoom Loom! The Zoom Loom is the perfect weaving-on-the-go tool, and this bag will keep yours from tangling up while traveling. The bag is roomy enough to not only hold the loom, but also a bit of yarn. Our largest bag size, Bulky Bags are for those times when you really just need a giant bag for your project, like bulky sweaters and afghans that require multiple skeins of yarn or just take up a lot of space. Like Mary Poppins' carpet bag, you can really fit a lot in these bags! From time to time, you may see a Deluxe Bag listing in the shop. Deluxe Bags are really special, and can vary in size. They feature the same details as our regular project bags like the pockets, twill tape loop, and poly/cotton drawstrings, but usually have special details like color blocking or amazing fabric such as handwoven ikat. These bags can vary in price and are limited edition, but not to be missed! Need something a little off the beaten path from our regular bag offerings? Have a special fabric you'd like made into a bag? We're always happy to make you something perfect for your project! Visit the custom orders page, or contact us.